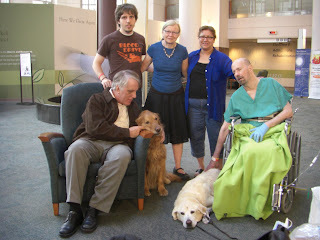 Hi all: The photo here was taken Thurs, when Dillon, Diane, Jack, Morgan, Will (Morgan's guide), and Richard visited with us in the hospital lobby. I love how golden retriever Will looks so concerned for Dillon and John. Just wanted to say a quick hello, and update you that John's pneumonia is worse. They have increased his supplemental oxygen and he is using a clear plastic mask over nose and mouth. He is also in pain and they are trying to diagnose what is wrong with the bladder and/or kidneys Today's hyperbaric treatment was cancelled. Today is our 24th wedding anniversary and John has given me lots of hugs this morning, even before I mentioned the date. I have to make an editorial comment here that he is such a wonderful man to be married to. The nurses all say, "What a catch!" Myles, John's dad arrived here last night from Buffalo and John was also blessed with visits from Natacha Poggio, and Mike and Jason, who had done graduate studies with John. Natacha had traveled to SXSW and zipped to Houston to see John. Mason, Ledia, and Wolf are on their way Tuesday. We are so touched by the amazing Paypal donations that we are receiving from you guys. It will help with expenses here in Houston for lodging and caregivers. We appreciate every single sweet word and kind act you have sent our way. You are like angels holding us up. You are comforting John and providing me strength to stay focused on this journey.